Aurora shooting: How social media can support a community in mourning. How Can Social Media Better Support a Community in Mourning? A professor who was on campus for the Virginia Tech shooting reflects on Facebook’s role after a tragedy. 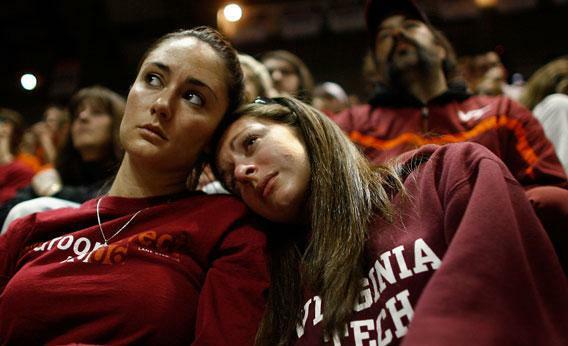 Virginia Tech students comfort one another during a ceremony a day after a gunman killed 33 people, including himself. For many of us, the news of the shooting at a midnight screening of The Dark Knight Rises in Aurora, Colo., evoked strong feelings about gun control, mental health care, and violence in pop culture, even parenting. But for me, it brought back memories of another shooting, one that coincided with the first great flowering of social media. I was a faculty member at Virginia Tech when we had our shootings. I very rarely talk about it, and I’ve never written about it. Of course, it comes to mind every time there’s another shooting, and I mostly try to hide from the all-too-familiar media blitz and political positioning that seems inevitably to follow. When the classroom shootings occurred, I was in my office, two buildings over, sitting on the floor—low down, away from the window with the door closed, as we had been instructed—on the phone with a former student discussing Camus. A floor above me, my colleague’s office was empty. He was in the classroom, where he died. No one knew quite what was going on at the time, of course. We had been told there was an armed fugitive on campus, but that was the second one in that academic year. We had recently had a series of bomb threats as well. The security lockdown had an eerie but very everyday feeling. In the days that followed, we came together as a community and developed a very clear sense that this was our tragedy—that, really, no one else was welcome. The local journalists were overwhelmed by the national media, who set up giant satellite trucks to broadcast live from our parking lots, quads, and pathways. Our administration put up signs informing faculty that we had the right to ask the media to leave our classrooms. I heard from a student that some reporters had passed themselves off as fellow Hokies, listened to the stories of students, and cried beside them before revealing that they were with the media. Interviews were conducted in which students were asked leading questions about how angry they were at our administration. Most of us had strong feelings of sadness and solidarity—even, in many cases, with Cho Seung-Hui, the 33rd victim, whom our community had also failed. But toward the national media machine—there we felt anger. Our tragedy had become a product to be sold, with a slick computer-graphic lead-in on every channel, and, of course, a point of leverage for those arguing for either greater or lesser availability of guns. I joined Facebook on April 17, 2007, the day after the shootings. In the information vacuum that followed the shootings, the VT community began to use a Facebook group called “I’m OK at VT” to check in and check up on others. We turned to social media to meet our own community needs and to maintain our own connections, to share our own information and have our own discussions. That month, Facebook reached 20 million active users. Today, it has approximately 900 million. Users’ relationship with Facebook has changed dramatically, as it’s grown from a college-centered socializing site to a widespread network including people from every demographic. The media have changed, too, as we have become more likely to get news and information from our networks rather than from the networks. With all of these changes, of course, we should expect that things would be different today for a community undergoing tragedy. Now, I don’t know what it’s like to be an Auroran right now, and frankly, it’s none of my business. But I wonder what social media’s ever-increasing reach means for a community in mourning. As the New York Times reported, social media have been used, as at Tech, to check up on people informally and ahead of official reports, although the increased user base and ease of multimedia communication have changed the character and publicity of social media memorials. I wonder whether having greater control over the representation of the lost has resulted in less of a feeling of alienation or, on the contrary, a strange burden. Friends and family are less on the outside of the process of public memorializing, which seems a positive, but the current prominence of social media also means that normal communications can become public utterances. Each tweet or public post becomes a potential quote, as with Jessica Ghawi, the budding sports journalist who tweeted as usual right until The Dark Knight Rises began and then died in the shooting. Normal social media use can become a constant involuntary and invisible interview. The notion of the “insider” has changed. In today’s Facebook-infused culture, someone with deep ties and personal history in an area can share in trivial details in the life of that community and the people in it, even if he or she has moved away. While it’s difficult to opt out of being a part of the community you live in, it’s increasingly possible to opt in to one from afar, once the groundwork has been laid. But it’s hard to say that you can really be a part of a community when you can just opt out of the parts you don’t like and when you’re not there on the ground when it needs you. As much as we might bemoan texting and sharing and poking and so forth, our new media environment means we are reading and writing far more than we were just a few short years ago. Do we spend more time today with more thoughtful communication—the more thoughtful approach to a story that we think we might respond to and comment on, rather than the passive reception of one-way transmission? I wonder, too, about the Aurora shooter’s face. For us, every time we saw Cho’s face, we knew our pain and loss was being extracted and sold. Like putting swastikas on book jackets, it’s sensationalism that moves the product. To show his face was to give him the publicity he wanted and to give him pride of place over those whose lives he ended—and to do so merely in order to increase interest in a perversely fascinated viewership made this all the worse. We looked away, and today I find myself looking away from this killer’s face. I don’t want to see it; I don’t want to let him be seen. Does his face show up in the Facebook feeds of those who were injured or of the friends and family of the fallen? Does it show up as often as it does in my feed? Is it easier or more difficult to see his face posted by friends, in what is, I am sure, intended to be a supportive and caring context?